Voter Turnout, Efficiency and Security - Are We Ready to Vote Online? In this online world, everything is gravitating to the web: banking, shopping, you name it. Then why is it, we’re still waiting in lines to vote? According to a 2014 study, wait times in a recent election were more than an hour in 13 North Carolina counties. What are some alternatives? How effective and secure are they? 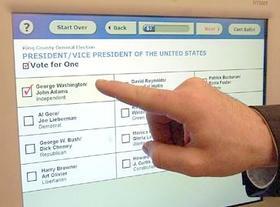 How do we create a more efficient way to vote and would it boost participation? We look into that. Joining Mike Collins on Charlotte Talks Friday, Governor Pat McCrory spoke out against the NBA's decision to move the 2017 All Star Game out of Charlotte. McCrory stood by House Bill Two and said blame should be placed on the city of Charlotte for passing its expansion of the city's non-discrimination ordinance, and on the media and groups like Human Rights Campaign for mischaracterizing HB2 and waging war against anyone who doesn't fully agree. Hear that and our Friday news roundup.